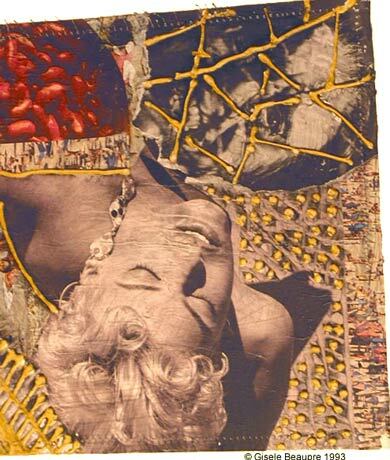 This image is part of a series of smaller pieces, separate from the main group of collages represented in the collage placemat series. These images were slightly smaller and were sewn together and treated in a more painterly manner. I worked on them as if they were intaglio or collograph plates, adding black (as if ink) and gold-mixed acrylic (an obvious reference to the notion of "alchemy", due to the notion of the conceiving of the divine power). I used a photograph of a Canadian super model and an older cinematic image of dracula. I was interested in the tension between beauty (the body) and immortality, associated with both figures. There is a strong anguish in being too attached to your body, yet anguish if you are not.